Hooray for awesome brownies! These brownies are ultra-chewy, dark, and rich with deep chocolate-fudge flavor and traditional soft, brownie texture, complete with a thin, crackly top. The mix’s included “coffee sprinkles” and good-quality chocolate chips enhance and intensify the well-balanced flavor. 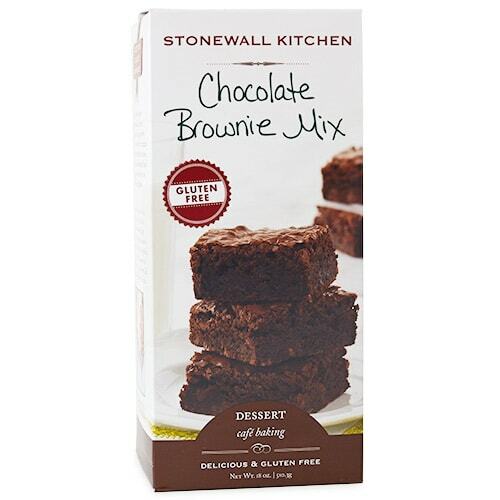 When we taste-tested this mix against more than two dozen others, Stonewall ranked at the top, giving us all confidence that this tasty offering can stand up to even gluten-ful brownies. OTHER HELPFUL INFO: To prepare the mix, you’ll need 2 eggs, 7 tablespoons of butter, and 1 (8-inch) square pan. NOTE: We only recommend products that we truly LOVE, use, and are confident to recommend. Thanks to affiliate partnership opportunities, we sometimes earn a small commission if you make a purchase through a product link on our site at no added cost to you. When we do score a few shekels, know that your purchase helps support our work to bring you trustworthy, unbiased information on an amazing gluten-free food and lifestyle.